This is the stunning debut album from Laraaji. ‘Celestial Vibration’ was originally released in 1978 under the name Edward Larry Gordon, and then first issued by Soul Jazz Records/Universal Sound in 2010. Soul Jazz Records are now issuing this hypnotic piece newly re-mastered album once again in a very limited vinyl edition of 1000 and new CD as a full Laraaji release. ‘Celestial Vibration’ is a cosmic journey sounding unlike anything else when it was first released in 1978. Laraaji’s album was first issued in New York as a private-pressing record with only very minimal distribution. His distinctive use of the harp-like open-stringed zither and kalimba creates a hypnotic trance like musical landscape. Laraaji first came to fame in the 1980s as a worldwide ambient artist working with Brian Eno on EG Records. At this time Laraaji worked with a wide range of experimental musicians - Jon Hassell, Harold Budd, Michael Brook, Bill Nelson, Roger Eno, Nana Vasconcelos and Bill Laswell. 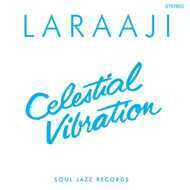 Since Soul Jazz Records/Universal Sound first released ‘Celestial Vibration’ seven years ago (now long deleted), Laraaji’s career has had a renaissance, releasing a string of new albums including a fascinating collaboration with Blues Control for the FRKYWS label, as well as reissues of earlier albums including a three-album cassette only release last year. Today Gordon continues his unique musical and spiritual path - performing his music mainly for meditation at yoga global retreats. He runs his own ‘Therapeutic Laughter Workshop’ where he coaches people in the mindful use of laughing for its health benefits.